Little Cottage is situated in the Conservation Area of Ampleforth, with two excellent village pubs, one of which is only a stone's throw from the cottage . In addition we have a fabulous village tea room and shop with Post Office. Little Cottage has recently undergone full renovation to provide stylish and comfortable accommodation for couples. The cottage is beautifully presented, with wood-burning stove, newly fitted traditional country kitchen, complete with baby Belfast sink. The property also benefits from a newly fitted elegant bathroom with bath and shower. To the rear there is a private 180ft well stocked cottage garden, with garden room and open views across Ampleforth Valley. Appreciate the spectacular views whilst enjoying afternoon tea in the garden! Ampleforth is a delightful village, nestled between the North York Moors to the north and the Howardian Hills, Area of Outstanding Natural Beauty to the south. Visit Ampleforth Abbey, set in over 2,000 acres of land, home to a community of Benedictine Monks, Abbey shop, with award winning Ampleforth Abbey cider and beer, honey made by bees from hives in the Abbey orchard. Tea room, with the famous 'Mousey' Thompson tables. Woodland and lakeside walks. Ampleforth Abbey's St Alban's Sports Centre, 25m pool, tennis, squash and fitness suite. Ampleforth Golf Club, 'pay and play' 9 holes set in grounds of Gilling Castle. Helmsley - 4 Miles, picture perfect market town, with elegant buildings and market square. Helmsley Castle, Walled Garden, Arts Centre, theatre, award-winning eateries and brewery. Follow the monks' trod to Rievaulx Abbey. Castle Howard 11 Miles - Grade I Listed country house, as seen in Brideshead Revisited. Whitby 38 Miles - Gothic Whitby Abbey, inspiration for Bram Stoker's Dracula, church of St Mary reached by 199 steps. Captain Cook memorial museum. For more information/photos and garden tour video please visit our Facebook page Little Cottage, Ampleforth. Please feel free to message us via Facebook with any questions and latest offers. Wood-burning stove and electric heating to all rooms. Cosy living room with wood-burning stove and comfortable armchairs. Refrigerator and small table top freezer. Welcome pack provided, milk, tea, coffee etc. Newly fitted cottage kitchen, with baby Belfast sink. Television in living room and bedroom. Lovely cottage garden with stunning views to rear. Patio at end of garden with lovely views. Although a nominally small cottage the owners, Sharon and Colin, have thought very carefully about how best to use the space available to maximise their guests' comfort and convenience. 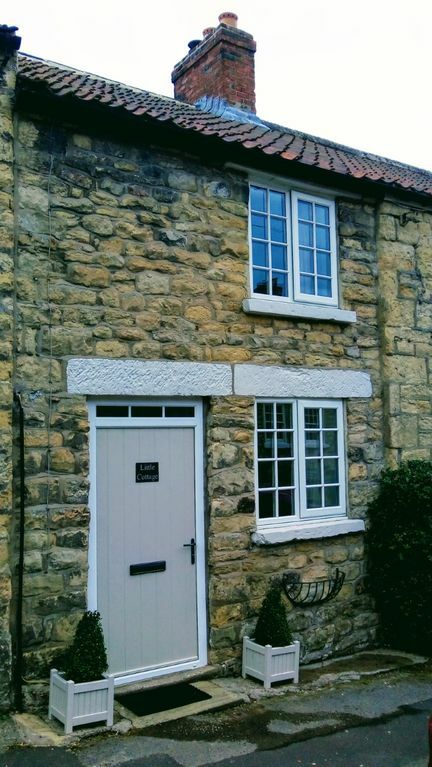 This small cottage has nearly everything you might want for a couple to enjoy the their stay in the cottage and the village of Ampleforth and its surroundings. The kitchen design and layout makes working there easy with everything conveniently to hand. The bedroom has all that's needed, including a torch in each bedside table to guide you in the night-should that be necessary. The lounge is comfortable and during our stay in February there was the benefit of an efficient wood burning fire. Being opposite the White Horse pub, with its warm welcome and great food is a real bonus. Thank you for your lovely review, we are genuinely delighted guests are enjoying staying at Little Cottage as much as we do. We are looking forward to seeing you both again later this year when you return to Little Cottage. A lovely and clean cottage in a beautiful village. I loved my stay in the cottage and can recommend it to anyone. The garden is a big bonus, I sat in the sun several times. De logburner is also very much appreciated. The area of Ampleforth is very beautiful and there is much to see and to visit. Thank you very much for your lovely comments, pleased you enjoyed your stay at Little Cottage. Thank you very much Bob & Sue, so pleased you enjoyed your stay. A beautiful cottage inside and out with good attention to detail. The garden can only be described as a hidden treasure. Will definitely be staying again! Thank you so much, we are delighted that you had a wonderful stay at Little Cottage and hope to see you again soon.